BC wines? There was also a time when the idea of serving of a BC wine was unthinkable. Today, BC wines rank among the finest in the world. Leading this charge to the fore has been the Sumac Ridge Estate Winery and its president, Harry McWatters. McWatters began making wine, as a hobby, when he was 16. Eventually, he became head of sales and marketing at Penticton-based Casabello Wines then, in 1979, teamed up with a partner to start a winery. They purchased Summerland’s Sumac Ridge Golf & Country Club, continued to operate the course (for cash flow) and planted grapes on 13 of its 41 acres. 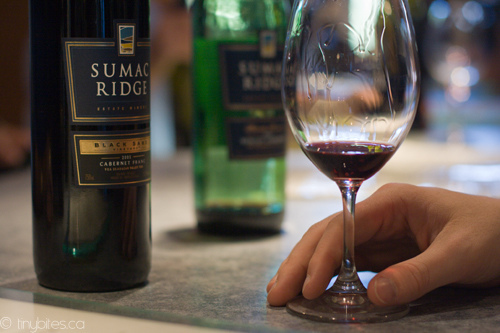 The creation of Sumac was made possible in 1977 when, in response to lobbying initiated by BC’s grape-growers, the provincial government passed an Order in Council allowing the establishment of cottage wineries. Wineries had to have a minimum of 20 acres of producing vineyard land, use 100% BC-grown grapes, source 50% of grapes from their own land and not exceed 20,000 produced gallons. McWatters lobbied a little further and had that increased to 30,000 gallons, or 15,000 cases. Thus, Sumac became BC’s first ‘estate’ winery. Now, BC has 15 estate wineries, 4 commercial (large) wineries and 41 farm gate (cottage) wineries. Sumac produced its first vintage in 1980. It has sold the golf course, but the Summerland winery remains with 15 acres producing Chardonnay, Gewurztraminer, Pinot Noir and Riesling grapes. In nearby Oliver, the company owns the 100-acre Black Sage vineyard, which produces Pinot Noir, Cabernet Sauvignon, Merlot, Cabernet Franc and Sauvignon Blanc. Sumac purchases grapes from other respected vineyards in the region and produces 25 wines in quantities of 125 to 10,000 cases, depending on the product. Annual sales are now $9.25 million. 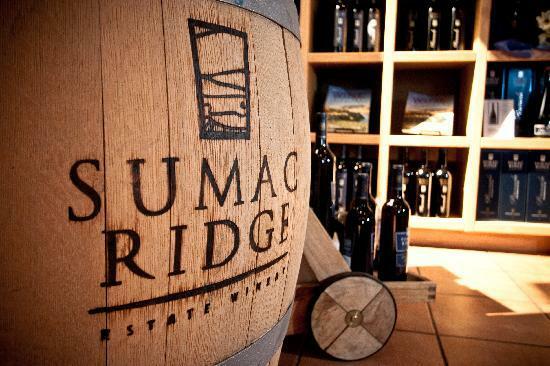 In 1998, Sumac was voted Winery of the Year by Wine Access magazine’s annual review of Canadian wineries. That year, Sumac was the most internationally awarded winery, receiving 21 Gold medals, 25 Silver medals, 33 Bronze medals and 6 Prestigious Trophies. Last year, the Globe & Mail named it Canada’s top winery. Its Pinot Blanc Ice Wine was awarded Grand Gold at the Concours Mondial de Bruxelles, it was BC’s first producer of methode champenoise sparkling wine, and it was the first BC winery to produce a Meritage wine (Meritage is a special, exclusive blend of traditional Bordeaux grape varieties.) McWatters also became the second Canadian in 77 years to win the prestigious Marketer of the Year award from the North American Agri-Food Marketing Association. The reason for this honour was two-fold. First, it was in recognition of the aggressive marketing activities with which McWatters established his winery’s identity. It was also in recognition of the fact that he has done so much for his industry. He was the founding chairman of the Okanagan Wine Festival, which attracts 73,000 visitors and is in its 19th year. He was the driving force in the creation of the Penticton Wine Information Centre. He is the chairman of VQA Canada, which oversees standards and deals with international trade issues; and he is Vice-Chairman of his industry’s national lobbying arm, the Canadian Wine Institute. Perhaps most significantly, he was the founding chairman of the BC Wine Institute, a trade association representing all BC wineries and its 200 grape growers. More specifically, McWatters was instrumental in introducing the institute’s VQA (Vintners Quality Alliance) program. 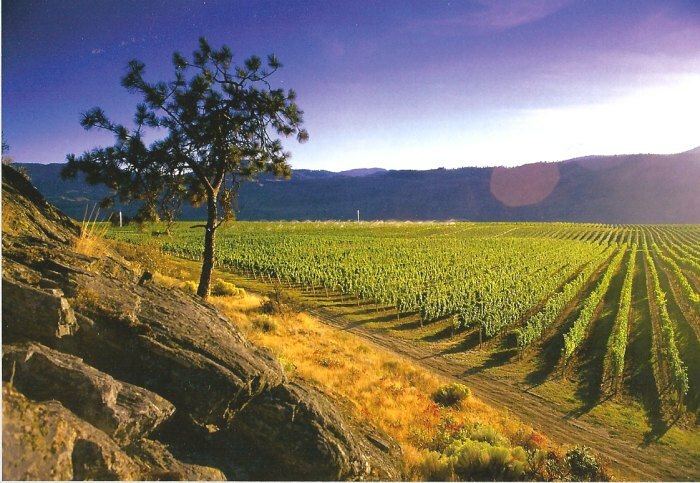 The VQA program, which came into effect in 1990, was the largest single thing that changed the direction of the BC wine industry. That year, all hybrid grapes—those that were a cross between North American and European varieties—were removed from the region. That eliminated the ‘foxy’ grape juice-style wines and left the Okanagan/Similkameen with a foundation of 1,000 acres of premium vinifera (true European) grapes. In 1993, winery owners planted 100,000 plants from France—the best varieties, the best root stalks for BC’s growing conditions. Today, the region has 4,000 planted acres, with less than 400 bearing non-vinifera plants. The VQA program requires that grapes have a certain threshold of quality before winemaking begins, and that wines be made according to strict guidelines. For example, if the label says ‘Chardonnay’, the fruit used must be at least 85% grown in the region identified on the bottle and it must taste like Chardonnay. If a vintner blended that wine with 15% Muscat, it would change the character of the Chardonnay and the tasting panel would reject it. As it takes a clear majority to approve a wine and every wine that comes out of BC is tested before getting the VQA designation, it should be impossible to have a VQA wine from BC with a fault, and everything on the label—the vintage, variety, region and characteristics should make a quality statement. North Americans have always had a strange relationship with wine. For the average North American in the 50s and 60s, wine was for special occasions and the Smart Cocktail was the beverage of choice. Meanwhile, however, Baby Boomers were drinking soda pop. In the mid-70s, when they started drinking alcohol, they still wanted cold, sweet and bubbly–hence the success of products like Baby Duck. Then people’s tastes became more sophisticated, possibly due to greater interaction between Europe and North America and the influence of the Mediterranean diet. North Americans became more concerned with diet, nutrition and consumption levels. They began to demand better food and wines—and they could afford to pay for it. At home, improvements in BC’s wine quality grew to the point where, in 1980, over 50% of wine consumed in BC was produced in BC. Today it’s 60%. In the 60s, respectable women wouldn’t go into a liquor store; today, 60% of wine purchases are made by women. The Sumac target market is the wine-knowledgeable consumer, with the prime focus being white-cloth restaurant patrons. (At liquor stores, Sumac’s wines are priced at $10 to $25.) The Sumac customer is aged 30-55 years, but McWatters has been trying to broaden that. He knows, for example, that people in their early 20s do not drink wine as often as the industry would like them to. He’s now looking at university students. On a per-capita basis, Vancouver consumes more wine than any other North American market (with the exception of Washington, DC—it consumes a lot more wine, but relatively few people actually live there). And one of the largest purchasing motivators in BC is the growing pride in buying Canadian—more and more consumers seek it out. This pride is one of the reasons why McWatters enters his wines in so many competitions. As McWatters explains, a key factor in marketing quality wine is, obviously, working with restaurant owners and staff. “When it comes to selling to licensees, sales calls are crucial—you’re often chosen for listing on the basis of the rapport you have with the restaurant owner. Our first sales call to a restaurant is an introduction and a discussion of the restaurant. This is an area where you accomplish more through listening—you find out about purchasing volumes, wine sales relative to food sales and the restaurant’s customers. “We don’t just drop off bottles and go away. We work with the servers. Whether they’re professional waiters or students working their way through university, we need servers to try the product and have enough information so they can feel comfortable talking to the customer about it. Then they can sell it and get more tips in their pockets. Sales are aided by two types of brochures: one providing basic information about the vineyard, its philosophy, its range of wines; the other is an elaborate booklet which includes photographs of wine, discusses them in more detail and adds a corporate statement. McWatters has four sales reps working from the winery, handling Alberta and most of BC. The BC Lower Mainland is covered by International Cellars, which has three reps handling Sumac. Five other agencies cover the rest of Canada; two American importers represent Sumac through their own distribution channels. Sumac participates in countless shows, often in cooperation with distributors and agents (they provide the manpower, share the participation fee and Sumac provides the product). “The wine shows and competitions are a very important part of our business,” continues McWatters. “We do a lot of food and wine-pairing shows, with the Beef Information Board, for example. The Okanagan has 150 events. We do on-site promotions such as winemakers’ dinners, pig roasts, a lobster festival. And we do a huge number of trade tastings—things like Canada a la Carte, which is for restaurateurs, retailers and media. Then there are the charity events…our promotional and marketing budget is $1.5 million. “But it’s money well spent. All promotions are interdependent. If you just did the shows and nothing else, the shows would be less valuable. The shows are valuable because you get people’s attention, measure their responses, introduce new products and take orders. “The competitions can get pricey—the least expensive cost three bottles of wine at $25 each, then you go to something like the International Wine & Spirit Competition in London and it’s six bottles at 100 British Pounds each. But if you win, you have that extra prestige and the extra PR advantage. To reach consumers who are already interested in wine and the culinary arts, McWatters spends $20,000 a year on print advertising—on ads, advertorial and inserts into magazines like BC Wine Trails, Wine Access and Wine Tidings. A small, though no less valuable, advertising expenditure is the $2,500 he spends on radio advertising in the Okanagan region. The purpose of that is to get people to visit the winery. The wineries of the Okanagan Similkameen are now the region’s number one tourist draw. Not that long ago, beaches were the number one draw—now beaches are number five, behind golf, skiing and camping. And the income generated by winery visits is nothing to sneeze at: last year, Sumac’s visitors generated $450,000, including $50,000 in sales of things like glasses, cork screws, garments and books. Today, the Summerland winery consists of the Cellar Door Bistro, a wine deck, a picnic site, a tasting room and the wine shop. Tours run all day, with 200 visitors daily during the May-October season. Guests usually stay an hour. While they wait for their tour, they have a glass of wine or browse in the wine shop. The 30-minute guided tour is designed to educate, remove the mystique and make guests feel comfortable. They taste four wines, including the champagne; they understand how the wine is made—and why it costs more. Then, hopefully, they buy more wine before they leave. Perhaps over the Internet. 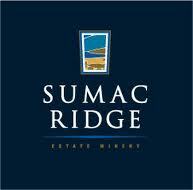 Sumac was also the first BC winery to establish a web site (www.sumacridge.com). It is an extremely thorough site which includes a complete vineyard tour, information on the BC Wine Institute, maps, product listings, recipes, a guide to food and wine combining and a sales page with special Internet prices in US and Canadian dollars. There are tips on how to pronounce wine names and terminology, plus press releases and events and awards up-dates. “We don’t use the site as effectively as other wineries use theirs, but we do recognize the power of it,” McWatters continues. “When we went on-line four years ago, it was the most comprehensive winery site in the world. Now, it produces less revenue than it costs to maintain it–we continue with it because retailers and restaurateurs use it. “We believed we’d sell more wine from the web site—unfortunately, we have to turn down as many sales as we accept because we get so many orders from American states where we can’t ship to. There’s open free trade only between Canada and 13 states—we can’t ship to Florida, for example. But we believe that those market channels will open up as restrictions are tested in the courts. Still, we remind people about the site—it’s another tool. This entry was posted in Food & Beverage, Marketing & Advertising, Profiles, Public Relations and tagged BC Wine Institute, BC wines, California, Canada, Canadian wine, Canadian Wine Institute, Chardonnay, Concours Mondial de Bruxelles, estate wineries, Harry McWatters, International Wine & Spirit Competition, Meritage wine, Okanagan Wine Festival, Penticton Wine Information Centre, Sumac Ridge Estate Winery, Vintners Quality Alliance, VQA, Wine Access.